Do you want to build a snowman? 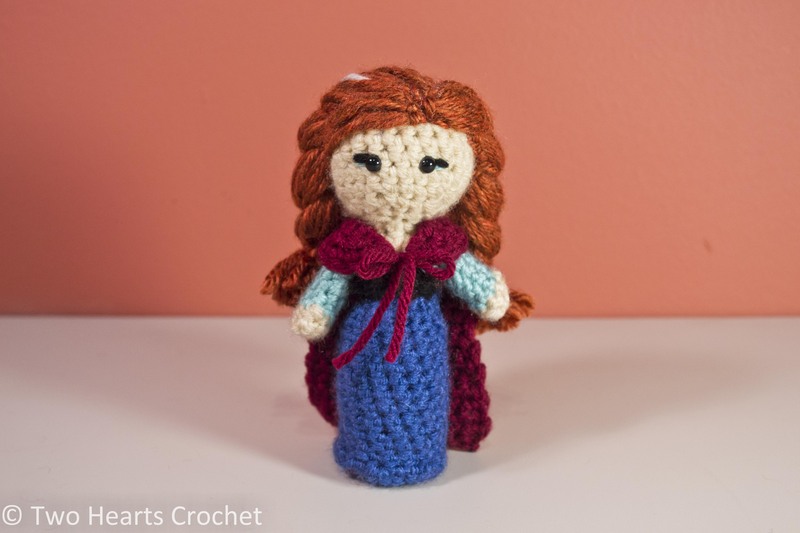 How about a princess doll? 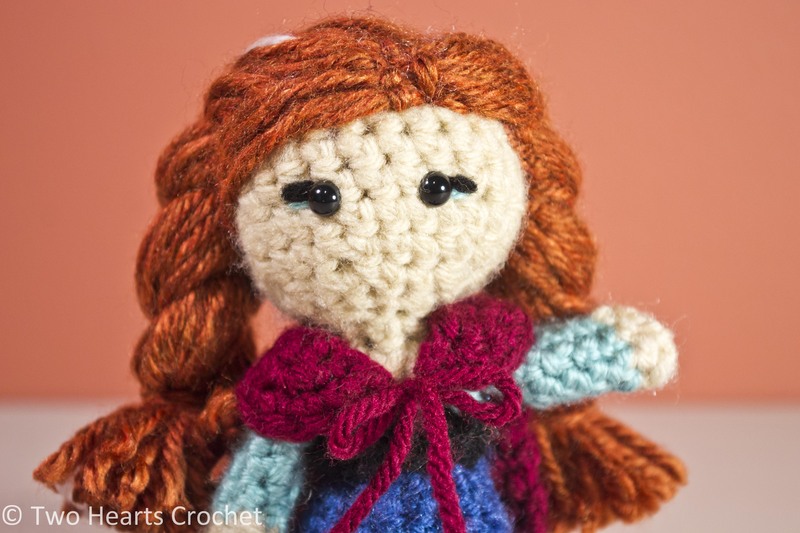 I am very excited to share this pattern for Princess Anna of Arendale from Disney’s Frozen. She is super cute (and so is her little cape! 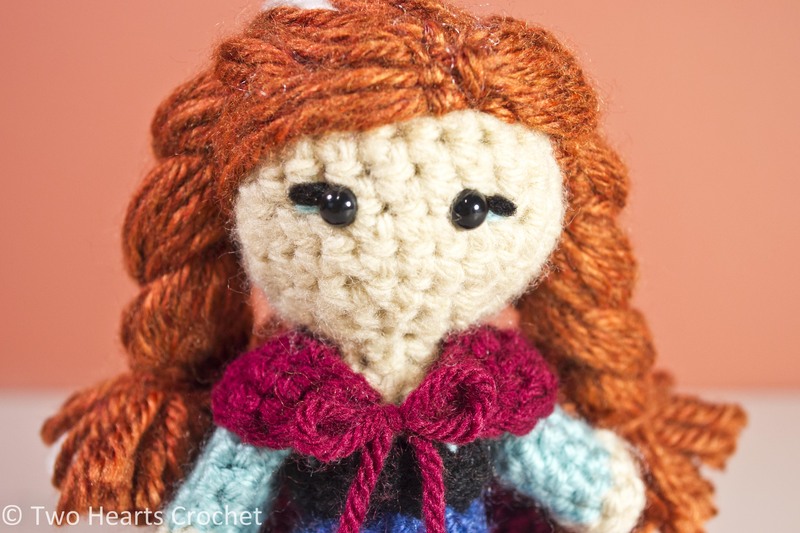 ), and I can’t wait to pair her up with her sister–and maybe Olaf, too! This pattern uses 6mm safety eyes. 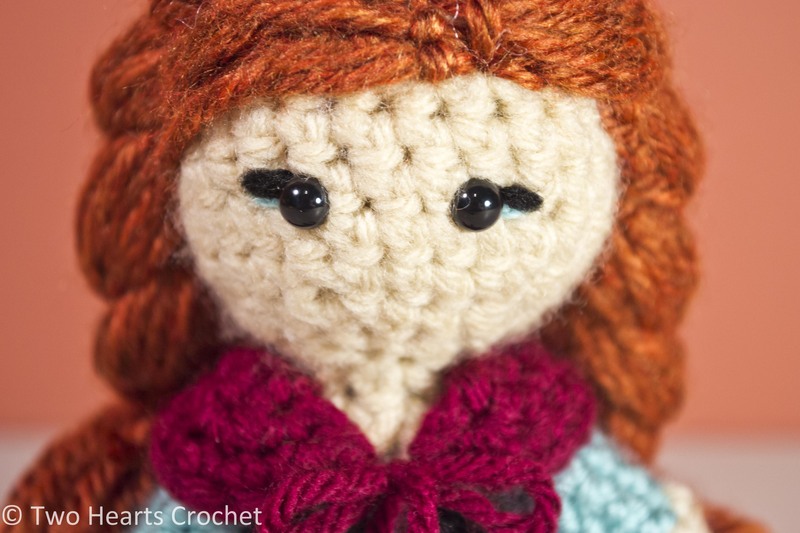 If you do not have safety eyes or do not wish to use them, I have included instructions for making the eyes out of yarn at the end of the pattern. Rnd 13: Work 2 sc in each st around. Switch to seafoam, join and ch 1. Rnd 14: In seafoam, work 1 sc in each of the first 4 sts, 2 sc in next st, 1 sc in each of the next 4 sts, 2 sc in next st, 1 sc each of the next 2 sts. Change to black, join and ch 1. 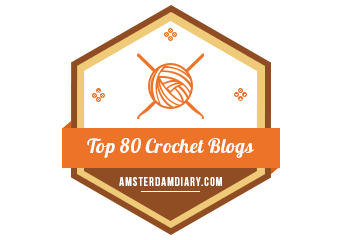 Rnd 16: *sc2tog* – repeat around. Change to blue, join and ch 1. Rnd 17: In blue, work 2 sc in each st around. Join and ch 1. Rnds 19-25: Work 1 sc in each st around. Join and ch 1. Rnd 2: sc around. Switch to seafoam, join and ch 1. Rnd 7: sc around. Join and fasten off leaving a long tail. Use a tapestry needle to sew closed the remaining hole at the top of the arm. Do not sew to the body just yet. Continue to work the back of her dress. Rnd 1: In berry, make a magic circle. Work 4 sc in center of the circle and then pull tight, making a half-circle. Ch 1 and turn. Rnd 2: 2 sc in each st across. Ch 1 and turn. Rnd 3: sc across. Fasten off and weave in ends, making sure you leave one end on each shoulder piece to use as ties for the cape. If necessary, use a tapestry needle to bring these ends through the work and to the front of the shoulder pieces in the “corners”. See photos if necessary. Rnd 1: In berry, ch 13. Starting in the 2nd chain space from the hook, sc across. Ch 1 and turn. Rnds 2-6: sc across. Ch 1 and turn. Rnd 7: sc in first 5 sts, sc2tog, sc in next 5 sts. Ch 1 and turn. Rnds 8-10: sc across. Ch 1 and turn. Rnd 11: sc in first 4 sts, sc3tog, sc in last 4 sts. Ch 1 and turn. Rnds 12-16: sc across. Ch 1 and turn. Rnd 17: sc across. Fasten off, leaving a long tail. 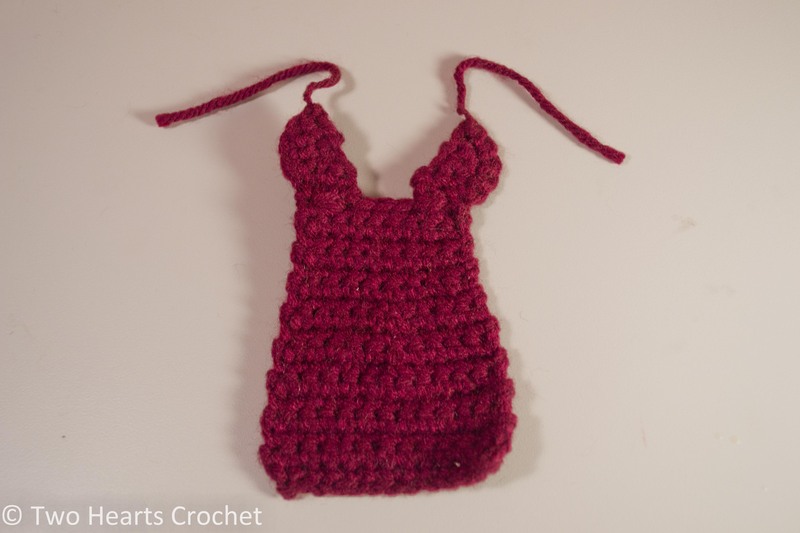 Use a tapestry needle and the tail ends of the yarn to sew the shoulder pieces to the cape. See photos for placement if necessary. 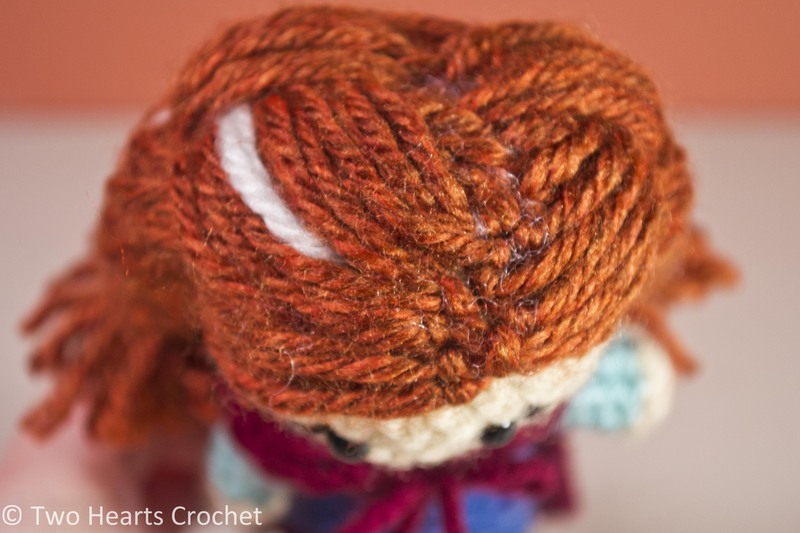 To make Anna’s cute little braids, I cut several strands of orange yarn and attached them to her head with a crochet hook and the method below. Click here to see an up-close photo tutorial with these steps if needed. Cut strands of yarn measuring approximately 10″ long. I don’t know how many I used, but if I had to guess, I would estimate 50. If you need more down the road, you can always cut more! Step 2: Fold a strand of yarn in half, forming a loop on the end. Place this loop around your hook. Step 3: Pull the loop through the stitch. Step 4: Yarn over, wrapping both strands of yarn together around the hook. Step 5: Pull the strands through the loop, essentially making a chain stitch with both strands. 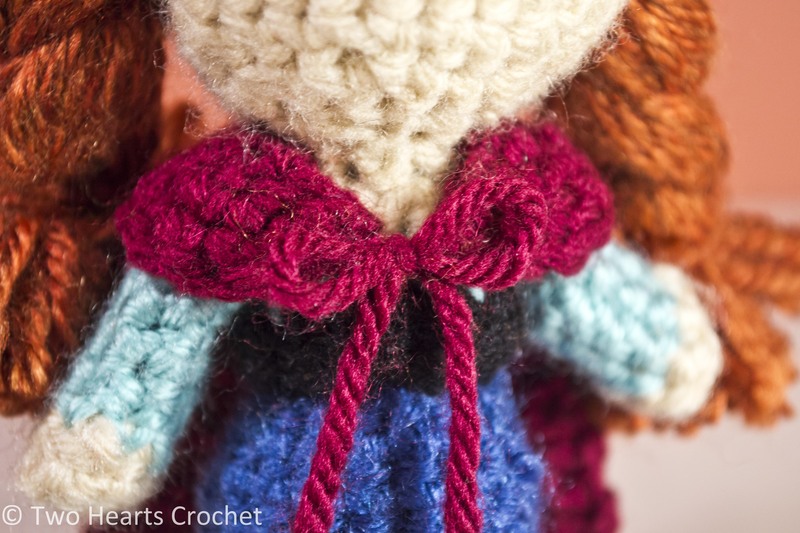 This knots the yarn at the base of the doll’s head. 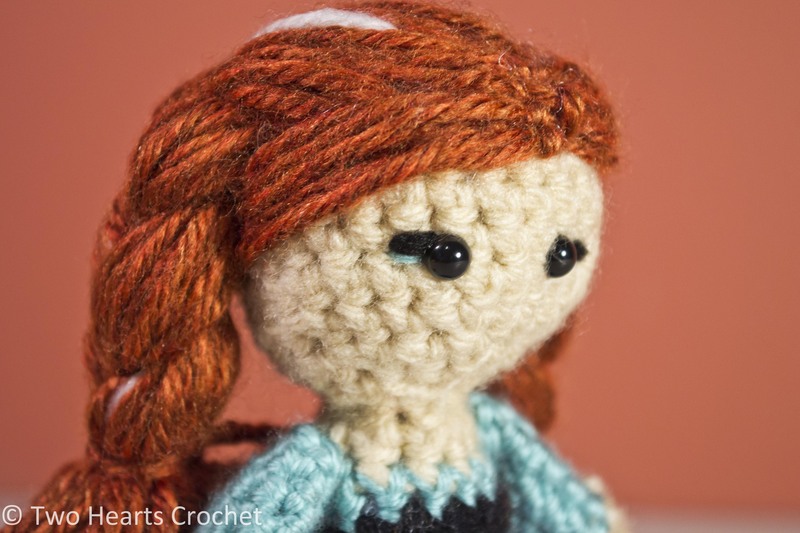 It helps to work a few strands into the stitches at the top of the doll’s head so that you make a sort of outline, then fill it in with the rest of the strands of yarn. Repeat these steps several times until the yarn fills the space for the hair. You can then braid her hair as shown in the pictures. 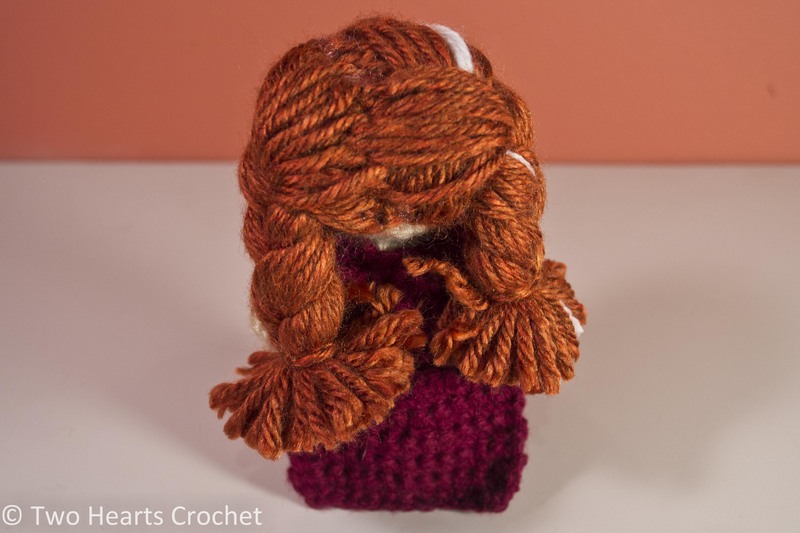 Because I made my Anna doll with the knowledge that her hair is not meant to be anything but braided, I was able to use less yarn (cutting down on the thickness of the braids). However, if you unbraid her hair (again, not my intention for this doll), you would be able to see the spots where I did not fill in the hair because you can’t see it when it’s braided. So if you want no bald spots at all, you’ll need to fill in the entire area like you would for Rapunzel or Merida. To finish the braids, I used a small piece of orange yarn and tied it around the ends several times, then trimmed to length with the rest of the braid. Take a piece (about 6”) of black 4-ply yarn and carefully split in half. The result is two strands of 2-ply yarn. Use a sewing needle to carefully make stitches on the outsides of the eyes. Weave in ends. See photos to get a better idea. Repeat for the seafoam eyeshadow detail, working the stitches below the black yarn. See photos if necessary. Weave in ends. I just love how perfect the colors are and I especially love her cape. Because her hair is so heavy, it even helps her stand up a little bit better. 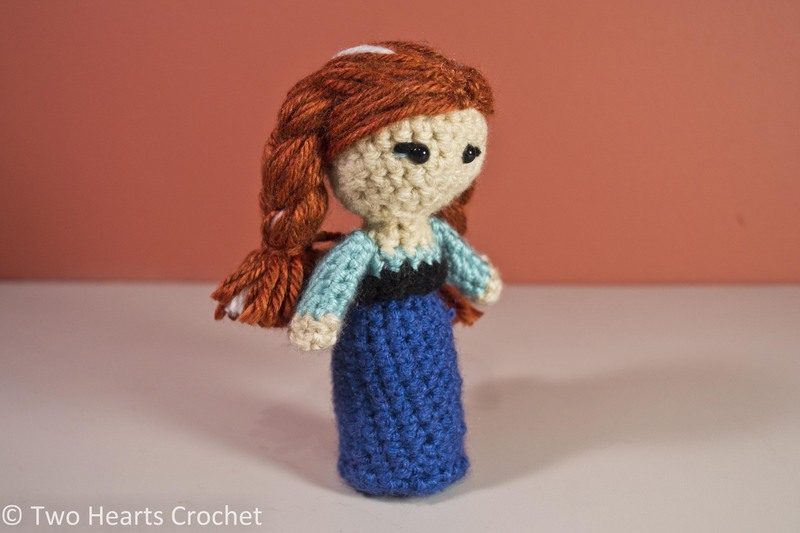 Next up is our final Disney princess, who is technically a queen, anyway: Elsa! 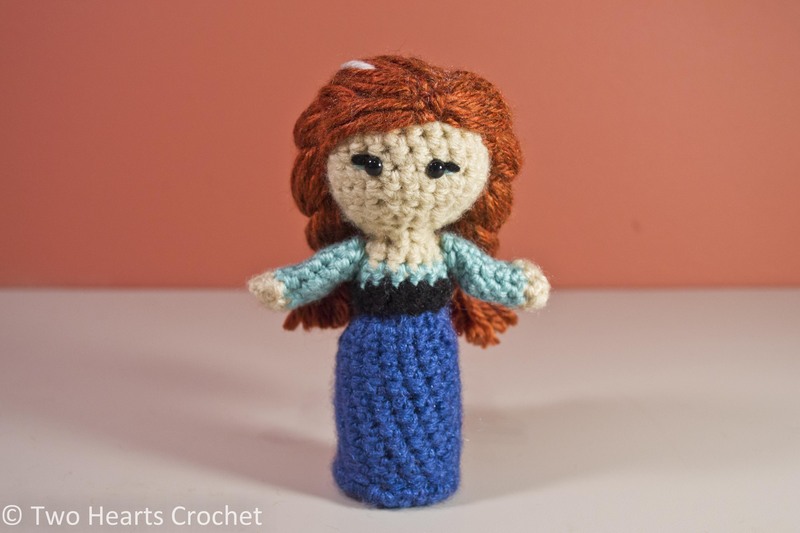 I can’t believe this long road of crocheted princesses is almost at its end. 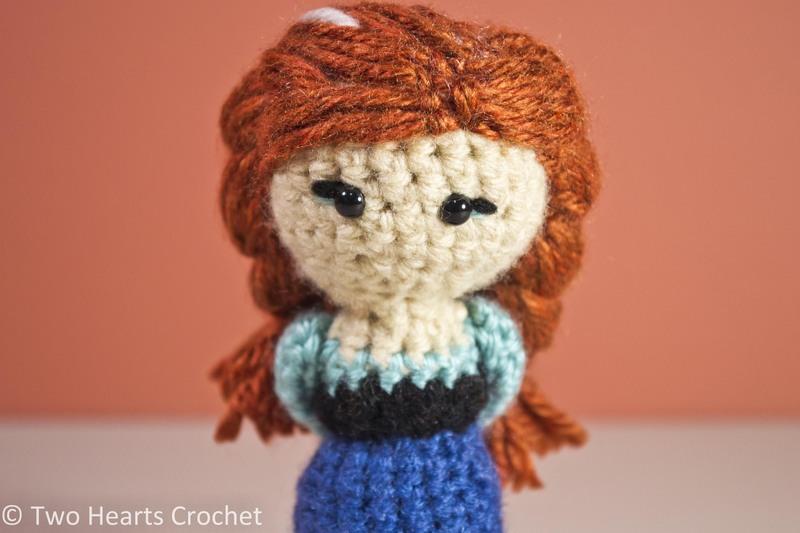 In the meantime, stay tuned for a pattern for Olaf and for Elsa!